From 2011 onwards, the Type 991 represented the most technically advanced 911 model to date. The 991 looked more powerful than any other 911 before – an effect that was heightened by the wider track and a wheelbase stretched by ten centimetres. It also featured adaptive aerodynamics: the 911 was the first series sports car from Porsche to adopt this technology from the 918 Spyder hybrid super sports car. The newly designed interior of the 991 was based on the architecture of the Carrera GT. It combined classic 911 elements such as the five round instruments – one as a high-definition multifunction display – with modern design and enhanced ergonomics. At the same time, the new Porsche Communication Management (PCM) was introduced with improved connectivity, multitouch monitor and real-time traffic information. The brand icon was more athletic and more powerful than ever before. The lightweight body in aluminium-steel design was again more rigid and helped to reduce the weight by 45 kilograms. The entry-level six-cylinder engine made do with a displacement of 3.4 litres, but still developed 350 PS. The S models produced 400 PS from 3.8 litres, and the GTS even delivered 430 PS from the same displacement. Following the new edition of the 991 launched in 2015, the 911 Carrera models also relied on the power of two turbochargers. In combination with a three-litre engine, the power outputs of the three Carrera versions, standard, S and GTS, were now 370, 420 and 450 PS respectively. 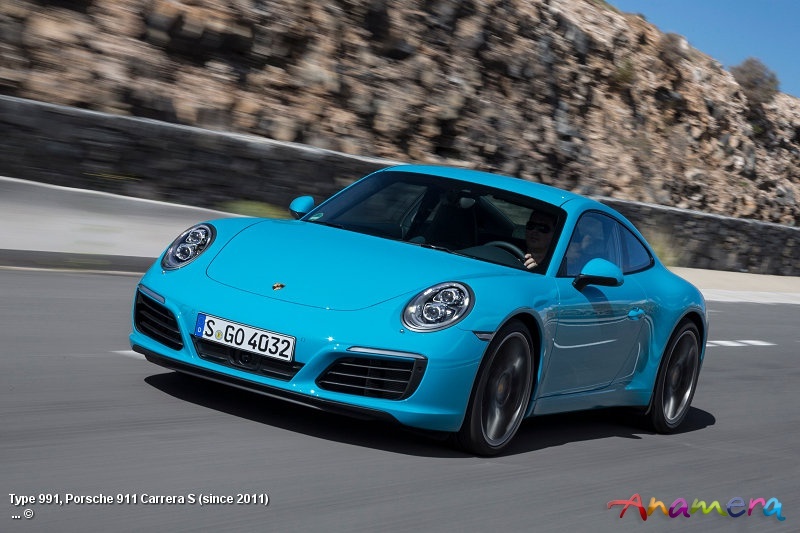 A 911 Carrera accelerated from zero to 100 km/h in less than four seconds. The fuel consumption and exhaust emissions were reduced. The available power also reached new dimensions with the Turbo and GT variants, with no less than 700 PS in the 911 GT2 RS. With a top speed of 340 km/h, this was the fastest series-production 911 in the model history. The 911 GT3 RS with 520 PS from its 4.0-litre high-speed naturally-aspirated engine featured more motorsports technology than Porsche had ever before offered in an on-road vehicle. A highlight of the model range was the 911 Targa, which incorporated the classic idea of this concept with a wide bar instead of the B pillars, and combined this with a clever roof design. Other highlights were model variants such as the weight-optimised 911 Carrera T, the extremely lightweight 911 R, which was produced in a limited edition of 991 vehicles, as well as the 911 GT3 RS with a weight of only 1,370 kilograms. The special-edition model “50 years of 911” was also highly coveted, with exactly 1,963 units being built. An important place in the company’s history is occupied by the Irish Green sports car with numerous exclusive features which rolled off the production line in Zuffenhausen on 11 May 2017: the one-millionth 911. The 450 PS jewel remains in the ownership of Porsche AG. The 991 generation of the 911 was the absolute best seller for Porsche. 217,930 units were built in the period from 2011 to 31 October 2018 and counting. In total, Porsche has produced 1,049,330 series 911s since its debut in 1963 to end of October 2018.